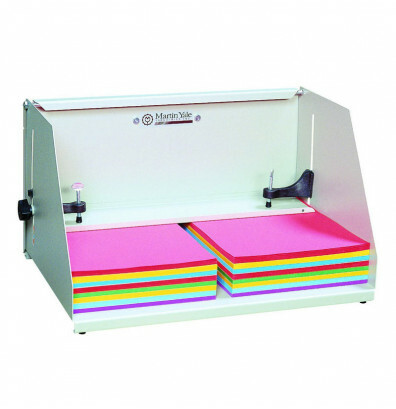 The Martin Yale J1811 jiffy padding press is perfect for creating carbonless forms, notepads, and scratch pads. The J1811 padding press will hold materials that are up to 5-3/4" high and 17-3/4" wide. Ideal for large and small print shops, schools and businesses. The Martin Yale J1811 jiffy padding press allows small or large print shops to quickly and easily create their own carbonless forms, notepads, and scratch pads. The sturdy metal construction means that the Martin Yale J1811 jiffy padding press will hold up under normal usage in a print shop environment. Padding press machine can be tipped back to allow paper to be pressed against the removable back to ensure your paper stock is always square and perfectly aligned. This padding press will hold materials that are up to 5-3/4" high and 17-3/4" wide. To use, simply place the material on the press and use the knobs on both sides to bring down the pressure plate. Apply the adhesive glue (not included) and wait until the material is fully dry before removing. Its compact size allows it to be placed on any table or desk. Weighing just 18 lbs., its sturdy steel construction ensures durability. Padding press is ideal for large and small print shops, schools and businesses. Perfect product for a small company. The quality is great. very happy with my purchase. Very nice, easy to use.Easy to move around. Very glad that we purchased it.